The main functions of the pancreas are to provide digestive enzymes to help break down food and hormones such as insulin and glucagon to control blood sugars. Cancer of the pancreas can interfere with this, which can lead to digestive problems and prevent you from absorbing all the nutrients from your food. Treatment options such as surgery, to remove all or part of the pancreas and/or radio and chemotherapy, can also cause dietary problems leading to poor appetite, nausea and vomiting, diarrhoea and changes in taste and smell. Poor digestion of fats, carbohydrates and proteins. This is caused by a lack of digestive enzymes which help us break down our food and absorb the nutrients from food. This is known as malabsorption. A symptom of malabsorption is a change in bowel habit to include pale, floaty stools which can be oily, foul smelling and difficult to flush away. Other symptoms include bloating, flatulence and weight loss. Poor appetite and weight loss. Weight loss is a common problem and is often caused by malabsorption along with poor appetite. Patients who become jaundiced may find they lose their appetite and experience changes in taste and smell. Jaundice can cause loss of appetite, taste changes, nausea, vomiting, and steatorrhoea. These symptoms usually resolve once the jaundice is treated. Diabetes that occurs because your pancreas may not be making enough insulin. Whilst this website contains useful advice about diet and nutrition for pancreatic cancer, you may find it useful to talk to a dietitian about your specific needs. 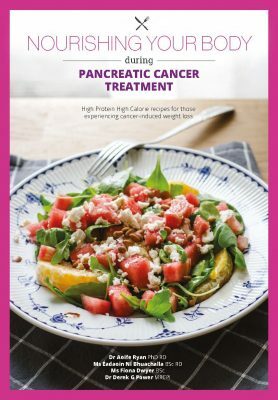 We have produced a recipe book created by dietitians and chefs at University College Cork, this recipe book provides advice on how best to combat cancer-induced weight loss and other eating related problems whilst undergoing pancreatic cancer treatment. To find out more and to order your free copy, or view online, click here.